"Mollie Weadon, recently left a widow, supported her boys by running a boarding house. Her fame as a cook was such that it was to her table the railroad men went during their layover in town." "Between 1900 and 1905, the E.E. Lake Store was built to accommodate an ice cream parlor, a general store, a barber shop, the post office, and a meeting and dance hall upstairs. ‘Drummers’ [itinerant salesmen] took meals at Mrs. Weadon’s: fried chicken, country ham, fresh vegetables, hot rolls, pies, buttermilk or sweet milk—all for 50 cents." This photo, taken in 1887, shows Ashford Weadon (c.1812-1894) and his family. Mollie O’Bannon Weadon, who was the second wife of Ashford Weadon, is on the second row right. Descendants of Ashford and his first wife, Laurinda (nee Bemusdaffer) are in the top row. If this picture was taken at Carrington House (as is by no means certain) it must have been in the back where the old kitchen was. 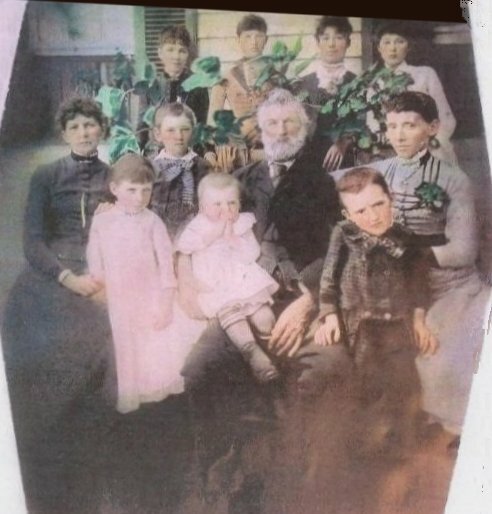 Color photography was just beginning to be developed at this time, so the pink gowns of the littlest children, the ruddy cheeks, and the greenery being held in the back row are probably the result of tints applied. We are indebted to coauthor Kandy Higinbotham for clarifying family relationships of the people pictured in the photo. Kandy is married to the grandson of Addie Higenbotham, pictured in the back row. “Adelaide Weadon” is actually Adeline H. “Addie” Weadon (1857-1929). She is the daughter of Ashford and Laurinda and is the “Addie H” Weadon buried in the Ebenezer Baptist Church Cemetery. As far as is known she never married. “Addie Higinbotham” (1872-1928). Was born Mary Adelaide “Addie” Trussell (daughter of James M. Trussell and Louisa Ann Trussell). She was single when the picture was taken and then married Ralph Higinbotham in 1897. “Miss Hill.” Most likely the “Amanda B. Hill”, who is listed as a granddaughter (age 18) in the 1880 census. She is possibly the child of Ashford and Laurinda’s daughter Margaret and Laban Hill. “Irene Phillips.” This is Irene F. Trussell (1871-1960) who married Alpheus C. Phillips in 1904. She is the sister of Mary Adelaide (Trussell) Higinbotham, and daughter of Louisa Ann and James Trussell. The family referred to her affectionately as Aunt Nena, and she is remembered most for the beautiful china that she hand painted. She is also buried in the Ebeneezer Church Cemetery, but the date of her death was never added to the headstone that she shares with her husband. “Polkie Prissell.” This is most likely Louisa Ann (Weadon) Trussell (1844-1914). The handwriting is unclear: “Prissell” is probably “Trussell”, and “Polkie” may have been a pet name for Louisa. Louisa Ann was the sister of Adeline H. “Addie” (Weadon) Trussell, identified in the top row. She is also buried in Ebenezer Baptist Church Cemetery with her gravestone reading, “Annie L. Weadon, wife of James M. Trussell.” Annie L. (aka Louisa Ann) moved in with her father Ashford and Mollie at some point after James’s death in 1875. Louisa Ann was living with Ashford in 1880 census, two of her children (Adelaide and Irene,) are in the photo, and the person pictured looks about the right age to be her. Her husband James served as a private in Company H of the 2nd Virginia Infantry in the Civil War and fought in the First Battle of Manassas (First Bull Run) under the command of Stonewall Jackson. “Paul Weadon” is the eldest child of Mollie and Ashford, listed as age 1 in the 1880 census. It is fairly certain now that he is the one referred to as Paul Ashford Weadon, Sr. on genealogical message boards. “Grandfather Weadon.” This is Ashford Weadon (c.1812-1894). Although Ashford lived his entire life in Snickersville it has been challenging to find definitive information regarding his birth and death. Census data records that he was a shoemaker and a landowner and owned several slaves. The obituary of Dr. Lee Weadon states that Ashford was a Civil War veteran, although he would have been 48 years old when the Civil War started. “Grandmother Mollie O’Bannon Weadon” (1848-1944). Born Mary Rebecca O’Bannon, the daughter of Enoch Washington O’Bannon and Sarah Jane Smallwood. Virginia marriage records specify that she married Ashford in 1875, when she was in her 20s and he was in his 60s. They had four sons together. Mollie is buried in Ebenezer Baptist Church Cemetery, but Ashford’s final resting place remains an unsolved mystery. “Karl” (Charles), “Tucker” (Clifford), and “Lee” Weadon: these small children are all sons of Mollie and Ashford. W. Lee WEADO.N., M. D.
Dr. W. Lee Weadon, a distinguished surgeon of Bridgeport and one of the proprietors of the Galen Hospital, was born in Virginia, October 8, 1882, a son of Ashford and Mary (O'Bannon) Weadon, both of whom were natives of Virginia. The father, a farmer by occupation, served as a Confederate soldier in the Civil war and died many years ago, but the mother is still living. Dr. Weadon was reared at Bluemont, Virginia, and acquired his education in public and private schools of that city. Having determined upon the practice of medicine as a life work, he later entered the University College of Medicine in Richmond, Virginia, from which he was graduated in 1905, after which he entered upon practice in West Virginia, there remaining until 1911. In that year he came to Bridgeport and purchased a fifty-one per cent interest in the Galen Hospital on Myrtle Avenue, an institution which is devoted chiefly to surgical work. Dr. Weadon has specialized in surgery and has performed very many notable major operations which indicate his superior skill. He possesses comprehensive knowledge of anatomy and the component parts of the human body, of the onslaughts made upon it by disease or left to it as a legacy by progenitors. Combined with his knowledge is a notable skill that arises from a clear head and steady hand, enabling him at all times to be cool and collected even in the stress of great emergencies. On the 20th of May, 1908, Dr. Weadon was married to Miss Mabel Faulconer, of Virginia. He belongs to the University, Seaside and Brooklawn Country Clubs, while professionally his connection extends to the Bridgeport, the Fairfield County and the Connecticut state Medical Societies, the West Virginia Medical Society and the American Medical Association. A final note: Genealogical curiosity led coauthor of this article, Mark Weadon, who is a great-great-great grandson of Ashford and Laurinda Weadon, to visit Bluemont several years ago, and he well remembers the house pointed out to him as Mollie Weadon's inn. He was struck by the beauty of the town and indeed of that entire region of Virginia. Annabel Hughes’ post about Carrington House on www.BluemontVA.org renewed Mark’s interest in finding out more about Ashford and his antecedents in and around Loudoun County. He is hoping to learn exactly what happened to Carrington House upon Mollie Weadon's death. He assumes the estate went to Mollie's sons (Paul, Tucker (Clifford), Karl (Charles), and Lee) who then sold it to the subsequent owner. He is particularly interested in contacting the descendants of one of these sons (most likely the eldest, Paul) whom he has reason to believe is in possession of a family Bible containing more information on Ashford Weadon's forebears. George Weedon (1734-1793) was Captain in the French and Indian War and a General in the American Revolutionary War. Between the two conflicts he was a prominent citizen of Fredericksburg, Virginia, operating a tavern in that city which served as a meeting place for George Washington, Thomas Jefferson, Patrick Henry, John Marshall and others to discuss politics and the future course of the American colonies.